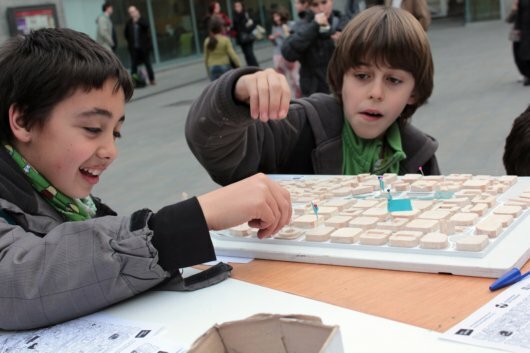 Children Finding their homes on the Neighborhood Model. 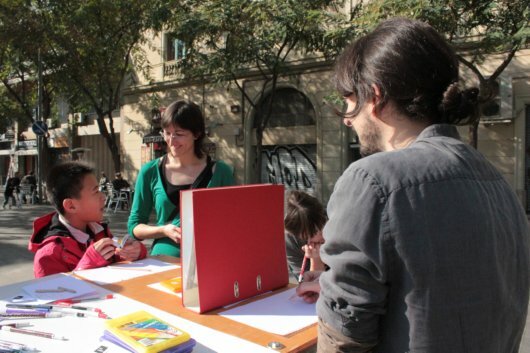 On Thursday afternoon, I was busy once more out with El Carrito — the mobile public participation cart — engaging people to participate in the public spaces of Fort Pienc, Barcelona with Raons Publiques. We asked students from the adjacent school to draw, on a blank page, their image of the neighborhood, in the manner of Kevin Lynch, a famous urban planner. Unexpectedly, one of the children asked my colleague Andrés if he too had drawn an image of the neighborhood yet, and then proceeded to challenge him to a draw-off! The event developed into games and origami. Several kids lingered around El Carrito – the mobile public participation cart – drawing, tracing maps and talking with us and each other, long after they finished participating. Pretty soon, they started engaging the residents themselves, including some nearby police officers, by handing out information flyers. El Carrito seems to be evolving into a classroom on wheels with potential to further engage the children; we hope to develop new activities in the weeks to come. The Fort Pienc Civic Center Plaza is by far the most robust public space in the neighborhood and includes the most diverse cross-section of the resident population. Our precise position in the plaza with El Carrito changes with the crowds: on Saturday mornings, we position El Carrito closer to Ribes Street where people promenade on weekends at a slower pace than on weekdays. On weekdays we deploy El Carrito either on axis with the library doors while school is in session and then move close to the school doors once the children get out. Unlike most schools that have doors on the main street, this one opens onto the plaza allowing both parents and children to linger, play and talk much longer than if it were a simple sidewalk. Most adults are brought over to El Carrito by their enthusiastic children. One of the most interesting conversations on this Thursday afternoon was with a woman who moved to Fort Pienc from Nevada, USA in 2003. 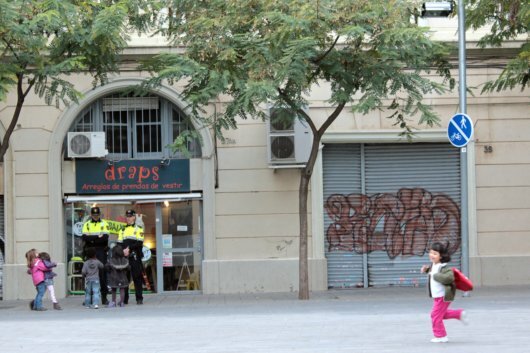 She currently lives north of the Civic Center Plaza in one of the Eixample blocks that still includes a public space at its center. However, there is no public access to this public space; it is a relatively wild park because maintenance is scarce. In fact, the woman lived across the way for some time, and could see this wild park from her parking structure, lamenting not being able to enter. She said that, according to some municipal officials, she believes that the park is underway to gaining public access. Indeed, after some investigation, we have found that the ProEixample public society will open access to this courtyard for public use. Earlier that day I met with Andrés to discuss the development of the project before heading out with El Carrito in the afternoon. We spoke about the incredible difference in the time dedicated to design versus site analysis – the exploration of social and spatial qualities of a place. While Andrés and I attended architecture schools in different countries, in both cases we learned to analyze our given project site for the first two weeks, sometimes one, but rarely over three, and spend the remainder of the semester, at least 12 weeks, on design. The ratio of understanding a place to designing a place is even less balanced in the world outside school once budgets and profit margins leave firms little time for exploring the area their project will affect. Many architects design projects for places they have never visited. The intervention in Fort Pienc includes both site analysis and a design component. The intended project area is an underused space, formerly part of the rail systems that terminated at North Station. (Once the city converted North Station into a hub for buses and cleared away all the rail lines, a great deal of previously occupied open space became available for new projects.) Now, Raons Publiques has already spent over a year analyzing the context of Fort Pienc; and as communities are complex systems, the focus of the project is still not on the design of a particular site. This is not to imply that city building is a linear process of analysis followed by design; rather, we hope to explore what will happen if neighborhood residents participate in the dialogue of design, and are not just the recipients of an autonomous project. For instance, two buildings of metropolitan importance within the limits of Fort Pienc are the music venue and museum L’Auditori by Rafael Moneo and the National Theatre of Catalunya by Ricardo Bofill. Views of L’Auditori (left) and the National Theatre of Catalunya (right). While the founders behind both projects, or at least their websites, claim to improve the neighborhoods in which they are placed, these structures act more like neglectful parents – a benign presence in the daily life of residents that may, however, have more relevant effects as catalysts for more outside investment. 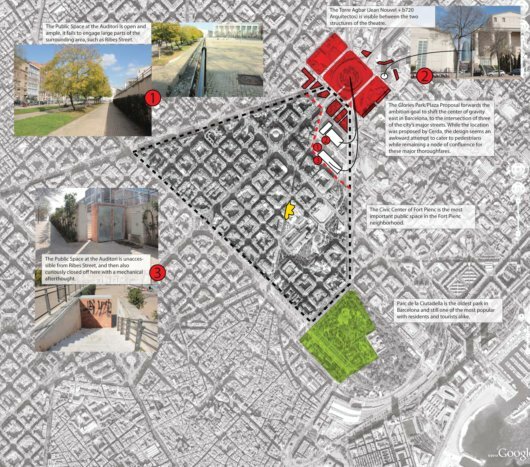 Diagrammatic Study of the affect of L’Auditori and the Catalunya National Theatre on the Perceived edges of the Fort Pienc Neighborhood. Diagram available at full size. But it remains unclear how participation can be a fruitful part of city building. It is important to note that, especially in the United States, projects of participation have proved effective in stopping unwanted development, such as the ­­famous examples of Los Angeles area residents stopping Walmart Supercenter Stores. However, in addition to stopping the bad, it is exciting to think of public participation as a creative force for good development. And so, the idea is that, it is not important to simply decide on a project, say an Auditorium, and then come to a neighborhood and ask people to help personalize the Auditorium. Rather, the Raons Publiques approach to participation begins with the initial recognition of underused space or lacking facilities, and then, through a process of getting to know the spaces and people of the neighborhood over time, a clearer idea of a project emerges. Project follows Participation.